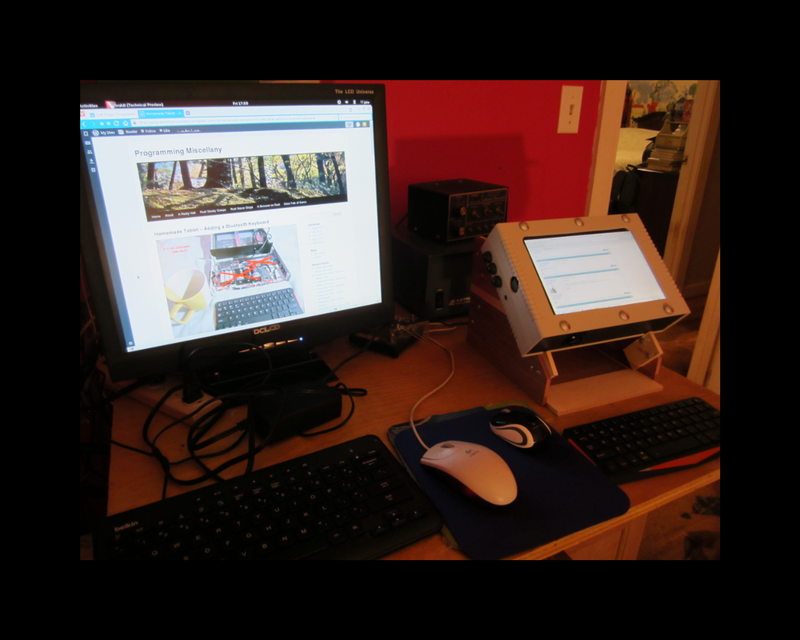 Figure 1: My workbench shows the diminutive tablet next to my regular LCD and computer. A few posts ago, I described the addition of a bluetooth keyboard to the little tablet’s accessories collection (or at least the attempt to do that). To this point, the effort has borne mixed results. I had purchased the little bluetooth keyboard with the orange trim, because it is tiny enough to be cute, and big enough to do the job. It’s also a Bluetooth 3.0 keyboard, with the latest Bluetooth bells and whistles, SSP pairing protocol, and all that. My main operating system on the Odroid C1 powered tablet is NetBSD-7/ARM. I expected that the OS would be able to do the Bluetooth version 3.0 thing, no questions asked. It seems that NetBSD is not really doing version 3.0 of the protocol yet. At least my trolling of the OS mailing lists gives me that opinion. Neither is FreeBSD supporting version 3.0 yet – AFAIK. But, all was not in vain. I knew (for certain) that Ubuntu 14.04 DID cover Bluetooth version 3.0, and so I re-imaged the microSD card with Ubuntu-14.04, downloaded from dn.odroid.com. The Bluetooth keyboard works like a charm when Ubuntu if running on the homemade tablet. So does the wireless mouse, and the USB WiFi dongle. With the internal batteries, I’m now cable free! To be fair, NetBSD did work fine with both the USB WiFi dongle, the non-bluetooth wireless keyboard, and the wireless mouse. I’m going to purchase a Bluetooth 2.0 keyboard in the hopes of making that work with NetBSD 7.0 on the little tablet, so that I can finally cut all the cables when using that favorite OS. The last hurdle will be to get the VU’s built-in touch screen to work with NetBSD, so I still have a couple wrinkles remaining to be ironed out relative to the accessories scene. Figure 2: I’d been carrying the tablet/keyboard combo around like shown in the figure. My daughter suggested that I could use velcro to attach it to the back of the case (easily pulled off for use, but still fairly securely moored with its mother). 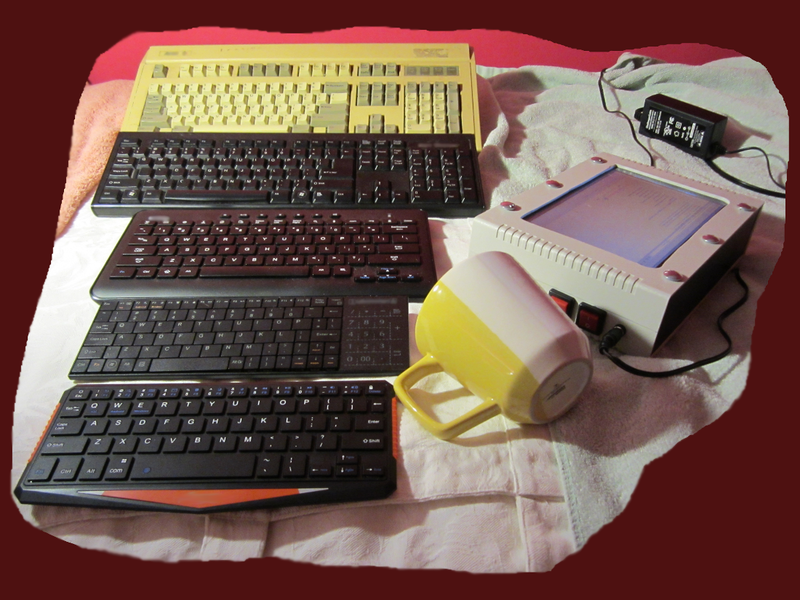 Figure 3: Comparison of five keyboards, listed from bottom to top: 1) Bluetooth 3.0 wireless, 2) Non-Bluetooth 2.4 GHz wireless, 3) Small form factor wired USB, 4) Standard wired USB, 5) Old PC XT era 5 pin DIN keyboard). All but the top and the bottom keyboards work with the homemade tablet when it’s running NetBSD. The bottom four keyboards work with the tablet when it’s running Ubuntu 14. I still haven’t found a Bluetooth 2.0 keyboard to see if that will work with the NetBSD uSD card plugged into the tablet. I suspect it will be fine. The non-Bluetooth wireless keyboard works with the NetBSD image, but I would guess the keyboard might have fairly primitive security, or none at all. I’m not certain. Its thumb pad does pretty well (doubling as a numeric pad, which is clever). I would be tempted to say that no kind of wireless keyboard has the security of a wired one, and would suggest NOT using one in any situation where security is an issue. I find it easier to type on the Bluetooth 3.0 keyboard than the non-Bluetooth wireless one. A close inspection shows that the spacing between the keys is significantly larger on the Bluetooth 3.0 keyboard. Neither of the wireless keyboards would be comfortable for long typing sessions. 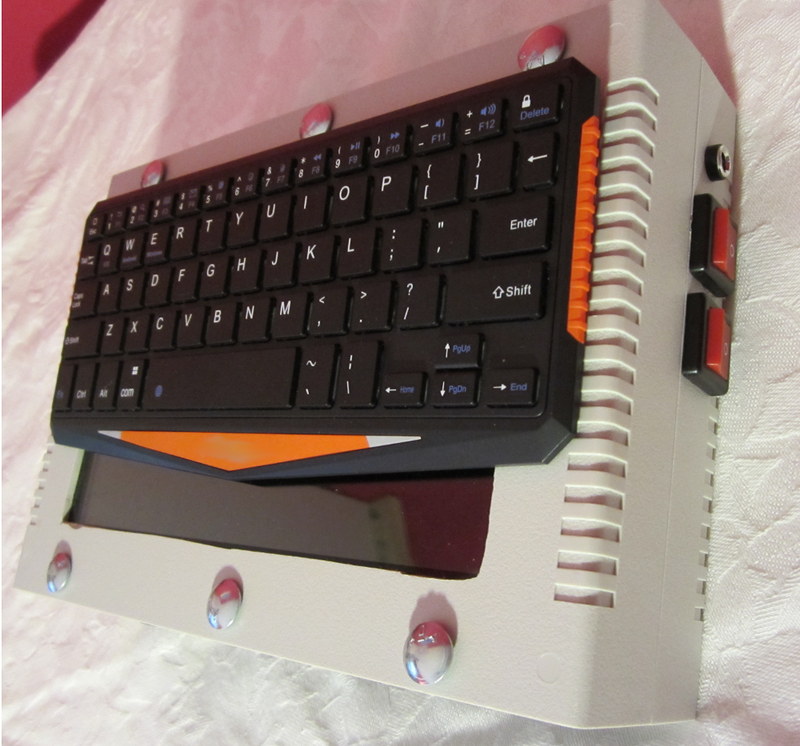 The small form factor wired keyboard would be the better choice for serious text input. 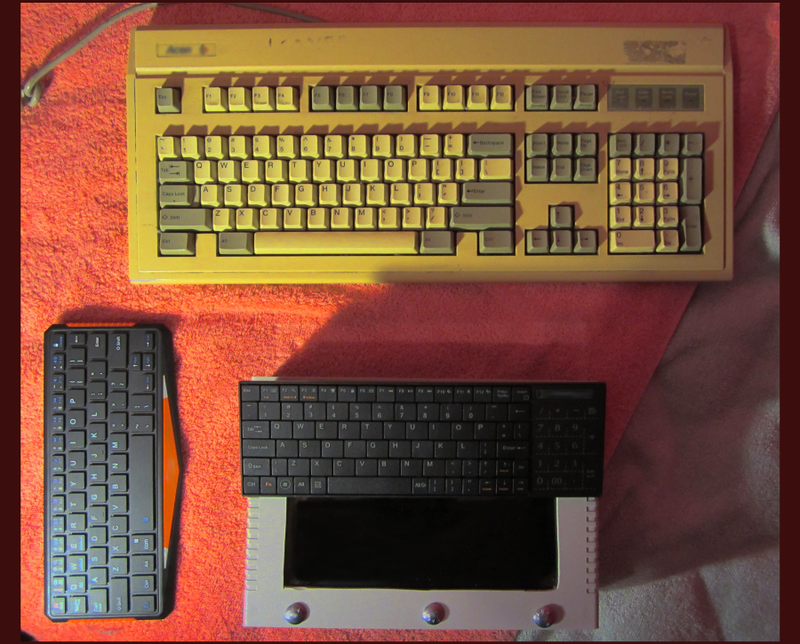 Figure 4: My old-time PC-XT keyboard (1988) compared to the Bluetooth and non-Bluetooth wireless keyboards (2015). Kinda wish I still had the PC-XT to go with the old keyboard! Note: NetBSD is a trademarked and copyrighted operating system (see details at http://www.netbsd.org). This author and site has no affiliation with NetBSD.